Forgotten-Empires - Home - Enjin - Important information! So much for leaving no rest for the wicked i suppose. Goodbye Everyone Viva La Vida. I am so sorry. I love you all i truely mean it. No homo haha. Anyways this is where i end for FE. I will leave a longer Message on my profile pic if you still care. HAPPY NEW YEARS MY DUDES!!!!!!!!!! Sorry Noctyy :( the kraken ate them. Oooo, I like the sound of that! I'm not a fan of PvP, but I could get into a mob arena! Thanks for the suggestion, GeoffreyVB! i would like to make a suggestion in the new towny or something! have a mob arena that you can go wave by wave killing stronger mobs, have vampires and werewolfs and whitchery stuff! man, it's been a while! i would've completely forgotten about this server if i hadn't gotten the community message email! i don't think i'll be able to participate in the most recent event, but maybe i'll swing by some time! I'm working on the Build comp and on the main server more. But I'll stop by to play around 1.13 server and share some mooshroom soup and bread also. *wail* you killed Azza :’( I will avenge you! Just because you were top voter for September, it doesn't mean it's nice to Snow on Me! Fivo, are you the one that made it snow here? Sorry, that "S" is supposed to be "so"
Hey Rider, how's things going? Towny server is back up - we may have experienced a small rollback. Towny server is down for maintenance - sorry for any inconvenience! New games added! see [link] for more info! BUMP! Server contest is ON right now! Voting is now working normally! 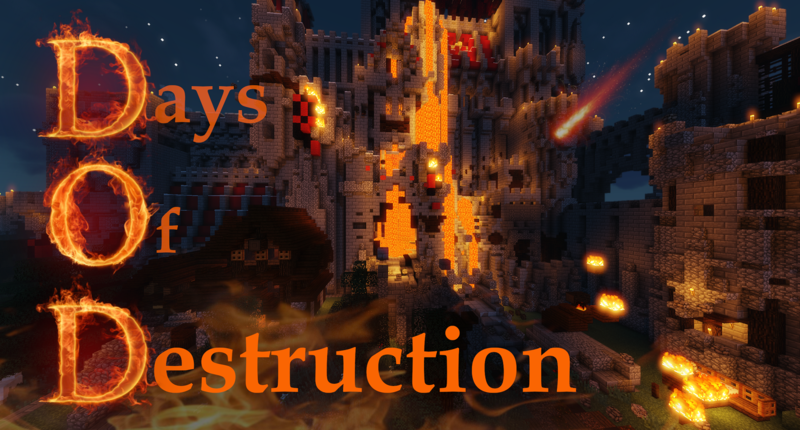 UPDATE: Days Of Destruction - now live! If you would like to contribute to the server, it is greatly appreciated!